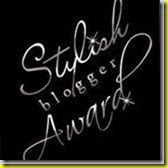 Early last month, I was awarded the Stylish Blog Award by my friend Blondee at http://blondeesdiary.blogspot.com/. Me? Stylish? I am very flattered. And very appreciatative. Award 7 recently discovered great bloggers; and contact these bloggers and tell them about the award. 1. In spite of the fact that I work in a construction office of 2 -- my boss and I -- and that my boss doesn't even come in some days, I still dress for "the office". I can't help it. There's something about a pencil skirt, hose and heels that just makes me feel all womanish and competent. 2. I have a British-style tea break every morning at work at about 10:30. I have tea (but it's in mugs and not tea cups) and bickies (biscuits or cookies in the U.S.) ... and I usually sneak a peek at my blog and/or Facebook. Shhhhhh! 3. I have a bucket list -- an honest to goodness list of things that I want to do OR that I will force myself to do before I kick it! Things like zip-lining over Steady Brook Falls back home at Marble Mountain. It'll be scary! And I will definately have my Depends on! But I've gotta do it! 4. In Grade 6, I was part of a gypsy duo with a cute boy in my class, Ronnie Locke, competing for the best Halloween costume in the whole school - Primary to Gr 8! He was going to play the guitar and I would dance across the stage; and we would surely win 'cause our costumes rocked! (And I had a crush on Ronnie, his being the new boy and all!) I wore a kerchief and a '50's dress that belonged to my Mom; it was a full-skirted satin number in teal and royal blue stripes and it was gorgeous! Ronnie was a swash-buckling looking gypsy dude with high leather boots and a big shirt. The blond haired fairy princess was first; then the 2 person horse was next; then it was us. Ronnie began to play his guitar and walk on stage; and I I got out under the lights and I froze! Imagine it -- me -- frozen! (I've come a long way since then.) There were a few sad costumes after us. But we did win 3rd place. 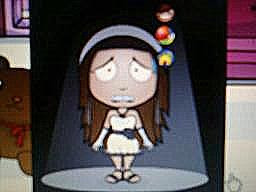 However, any future I had dreamed about with Ronnie was dashed on the rocks-of-despair because he was so upset at me. Ah well! It was 1966 and I had won half of the $20 prize; it made up for love lost! 6. I have really, really been in love 3 times in my life: #1 I broke his heart; #2 he broke my heart; #3 we broke our kids hearts ... but then learned to get along and care for each other again. 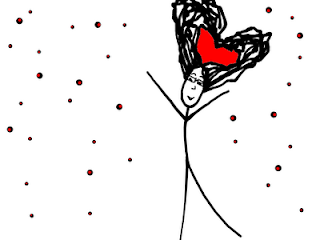 I still believe in love. It's on my bucket list! 7. Sometimes when I'm alone, I pretend I've won the lottery; not a huge amount, but enough to keep me comfortable and pretty up the house. Then I walk around the house making changes in my mind and dreaming of a personal masseuse named Sven who makes house calls. So there you have it; 7 more secrets are out in the open. I am passing the award on to Ðαωᾔ at Creative Cain Cabin because when it comes to stylin', she's the gal! She has a great eye for color and co-ordination, she sometimes makes her own clothes, she has great accessories (and hopefully will send me those yellow shoes now that I've given her this free plug), and she makes the cutest jewellery. She's a one-woman style icon!! Thanks to Blondee for this award. I really appreciate it and the kind words she wrote about me. Congratulations on the award ya stylin' gal!!! I sure enjoyed readin' your list! God bless ya and have a fantastic day!!! I often dream of winnin' the lottery! Hey, 10 bucks is 10 bucks. I hope you bought yourself something nice with it. That was a lot of money in 1966! You are so funny, I enjoyed reading your secrets. Thanks for the award. Debra - As far as I can remember, I used the $10 exactly the same way I would today. I bought chocolate! 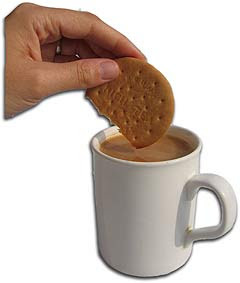 Ah, tea breaks make the world go round!! I don't think we could get by without them downunder here in OZ! I need to try the lottery thing! Stopping by from over 40 to say hello and follow. Hi, I am a new follower thru the hop and I have one too! Makes you feel kinda good when I really don't know what I am doing half of the time. New to blogging with about 4 months. I am following your blog thru GFC and would love a follow back. Have a great weekend and Happy Easter!